When was the last time your car dealership sent you a notice – just before your car went out of warranty – telling you about known problems on your vehicle that should be checked before your warranty expires? It just doesn’t happen. The truth is, unless you come to them with a complaint about a problem under warranty, they will never fix it. They don’t like to do warranty work. It’s just not profitable. Want to Save Some Big $? 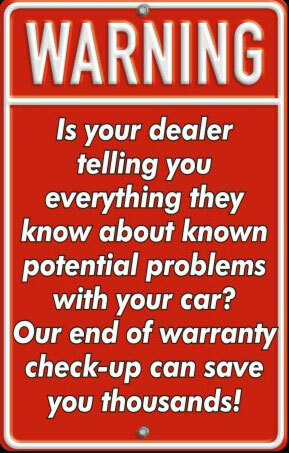 Call us just before your new car warranty expires. We will do a complete car condition inspection for free. We have the data on known problems with your car. We can fix anything that is not under warranty right here and then send you to the dealership with a list of everything covered under warranty so you can have it repaired for free – before your warranty expires. This can save you some serious money! Make sure that used car is not just a big package of costly problems. We can tell you what needs fixing (if anything) and you can renegotiate price with the information, or just get out of a bad deal.